Hermès is a house that I admire with my deepest soul. Everything about Hermès demands my attention – through its luxurious scarves and ties to its impeccably polished leather goods down to its elegant perfume collection. 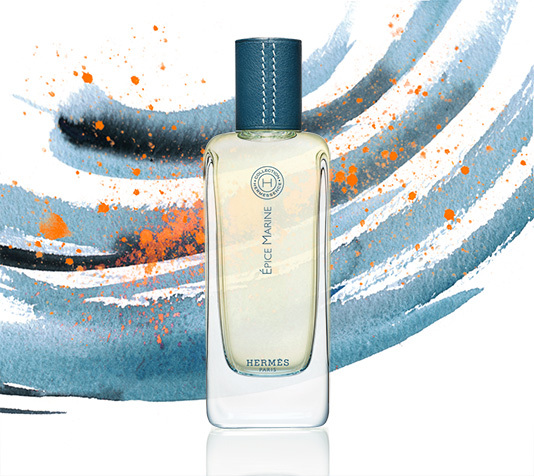 I have worn many Hermès perfumes through the years but nothing compares to the quiet gracefulness of the Hermessence collection. Many say that the perfumes are too fleeting and airy to command such high prices. I on the other hand love the fact that they seem evanescent. Osmanthus Yunnan is a favorite of mine and when I wear people still comment on it in the afternoon. Certainly not fleeting! Now, when I heard of the next installment for the Hermessence collection I was quite curious as to how the spices used in Epice Marine would compare to the rest of the Hermessence collection. I need not have feared for in the hands of Jean-Claude Ellena the spices add something quirky and fun to the final development of the perfume. Fragrantica lists the notes as: cumin, hazelnut, sesame, cinnamon, cardamom, bergamot, sea notes, whiskey, vetiver and oakmoss. Epice Marine opens with a strong toasted/roasted cumin note which I find delectable. In fact I find it so delicious that I keep finding myself wondering what is for dinner (I enjoy cooking with cumin and always start by toasting it in the pan). The cumin note is quite dominant and because it is roasted it gives it a very different feel compared to other cumin heavy perfumes which may be perceived as ‘sweaty’. There is quite a bit of cardamom and what I want to say lime, which must actually be the bergamot, as well which gives me the feeling that I am about to sit down for a lovely curry dinner. Hmmm – do I really want to smell of curry? And before I can write off this perfume for good, it takes a different turn and starts to pull in the woody aspects with the vetiver and then the bergamot starts to fade into the background but does not disappear. I love the ride that the perfume is giving me. This stage lasts quite a bit longer than the initial blast of cumin. Now I have cumin and woods and slowly the salt adds a new twist. The most relaxing and de-stressing part of this perfume is the late drydown. It is a wonderful ‘marine’ scent which is constantly mingling with the toasted cumin and woody notes. I do not get any whiskey notes at all. Jean-Claude Ellena decribes Epice Marine as ‘a pirate Hermessence’. I find it to be too hypnotic to be a pirate. It is so soothing and smooth that it feels as if I am relaxing at the beach listening to the waves crash, soaking up the sunshine which is so seriously lacking here. 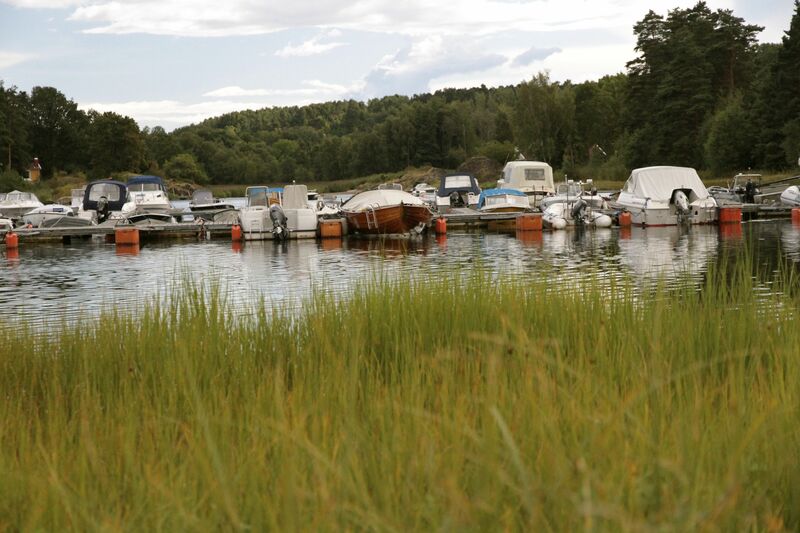 This is not the beach in Fort Lauderdale which I also adore, but rather the cabin at the fjord in Norway with the ocean in the background and the lanterns on the deck warming the evening sky. Take a look at Olfactoria’s other Hermessence reviews here. This entry was posted in By Sandra, Fragrance Reviews, Hermès, Spicy, Woods and tagged Fragrance, Hermes, Hermessence, Jean-Claude Ellena, Perfume, Review. Bookmark the permalink. LOVED Epice Marine. It was a wet pepper in the sea on me and I found it thoroughly invigorating. It was a long laster too but I can’t remember how it ended up. I will revisit. The local Hermes is sometimes quite good with samples. It sounds truly original and fascinating. I am definitely going to try this. Lovely review. Thank you. It is very different from the rest of the Hermessence line. Let me know what you think when you get to try it. Really? Right, must see if this is the Ellena for me. Last time I went to buy a Jardin I tried them all and ended up with Spice Bomb from V&R instead. Anyway, this sounds like ‘beyond calone’ and with interesting spice notes. Excellent review. Thanks. It is definitely beyond calone. You must enjoy spices because they last throughout the development. I hope it is to your liking. I haven’t tried this yet as Hermessence line is not available here so getting any is always a problem. I bought it for my husband for Christmas and decided to try it for myself. He will just have to deal with sharing this one. Have you tried any of the Hermessences? I wish I could smell the whiskey. Let me know if you can detect it. Yay! You too – cumin in the hot oil is a wonderful smell. I think you should abuse the whole Valentine’s Day schmooz fest. Thank you for another great review, Sandra! I thought, it wouldn’t be for me, because I normally detest cumin notes in scents. Just the opposite here, maybe because it smells toasted or because it’s so well blended with the other spices and marine notes, I just love it! And although EM seems like a summer scent to me, it wears quite well even on really cold days. Thank you. I could not agree with you more – this is working beautifully in the cold and I look forward to trying it when it is warm. This is a unique Hermes. Today it’s warm and sunny here and I thought this morning, what if Épice Marine is not citrus-y enough for me in summer? So I layered it with Bigarade Concentrée – and what happens, is that there is more long-lasting citrus and the spice notes are softer, but deepened, maybe because of the added cinnamon from BC. I am so pleased with the idea and happy with the result, it smells fantastic together. Oh that sounds lovely Safran! I will have to give that a try this summer when it gets nice and hot. Thanks for the tip. Sandra, you are spot-on. It is definitely toasted cumin as opposed to “sweaty” cumin. Very spicy but great on the right guy (or girl!). Not a watery perfume at all. It was fab on Portia. I’m glad you love Osmanthe Yunnan too. It also lasts on me, thank goodness. I am glad to hear that Osmanthus Yunnan lasts on you too. Epice Marine was still there in the morning. I love spices and was quite shocked that I enjoyed the toasted cumin so much. This is unlike any other ‘marine’ scent I know. I hope you enjoy it and that it passes muster. Another Osmanthe Yunnan fan here! Have been getting more and more into spicy perfumes of late, even masculine-leaning ones, so would be curious to try this – not least to learn how ‘toasted cumin’ smells! Thanks for an interesting read. Yay to OY! I am also enjoy spices at the moment. Perhaps it has to do with the weird weather we have. Oh I feel for you guys. My family is suffering in Wisconsin and Atlanta! Dream the snow away. Perfume is wonderful for transporting you to another world. Hope it gets better soon. I’m impressed by this review. I have tried Epice Marine, too and it is very “special” – I like what’s left of the fragrance after a while, but not right from the beginning. Happy Valentines! i do understand that the start can be quite intense. You are right – the drydown is just lovely. Go go go! Head downtown – you won’t be disappointed. It is Saturday evening as I read your directive to head downtown. Hermes is closed on Sunday!!! Well Monday is a holiday here so I will sneak down on Monday for a whiff! Thanks Luv! I do wish there was a place here to try the full Hermessence line. I have tried a few, but not this one. I adore the smell of the cumin as it slowly heats in the pan, releasing the most appetizing scent. Then crushing the toasted seeds in the mortar just makes me swoon. I always have to run the bowl over to my husband and insist..”smell this!! !” This lovely review has me intrigued. I look forward to trying this someday. Thank you!! If you like the smell of toasted cumin in your food you will certainly find this perfume wonderful. I hope you can try it soon. I look forward to trying this perfume (I have positive feelings for Hermes even though most of their perfumes do not really wow me – but I own and wear some) but I’ma little worried: cumin usually doesn’t play nicely on my skin. But I’ll give it a try.